CST Inc., a 25 years privately owned Memory Tester Company has announce the delivery of its New RoBoFlex-MiNi AutoMatic Handler System on August 15, 2009. The RoboFlex-MiNi Handler is the latest innovative 4th generation Automatic Memory DIMM / SODIMM Module Handler System and is highly recommended for high volume DIMM manufacturers, memory distributors and computer assemblers. 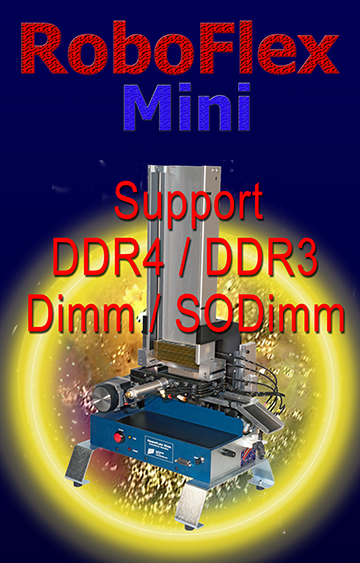 Operating the Light-Weight ( 20 pound) and Compact RoboFlex-Mini Automatic Handler is an experience in simplicity, enabling memory module manufacturers to quickly and cost effectively achieve world-class memory module testing quality with very minimum investment. Its innovative design concept and performance sets the RoboFlex-MiNi Handler apart from other competitions and position itself into a class of its own. The RoboFlex Handler seris - Automatic DIMM/SODIMM Handler is now the best seller among the memory module manufacturers and distributors. This affordable RoboFlex-MiNi handler system uses a direct socket insertion concept similar to many expensive Pick-and-Place robotic systems. The RoboFlex-MiNi system acts like mechanical hands that gently pushes stacked modules horizontally into the tester socket one at a time. After the test, the module is withdrawn from the test socket and bin as good or bad by a "Bi-directional" conveyor system. Good modules are place into the Right Bin- and Bad modules are placed into the left bin. No output mix-up is, therefore, possible. "I am pleased that this new automatic handling system has now been verified by major memory module manufacturers to be 100% compatible with their DDR/DDR2/DDR3 DIMM testing" said Cecil Ho, president of CST, Inc. "This patented technology will now bring ease-of-use and high reliability to the memory module manufacturing industry"
The RoboFlex-MiNi handler is equipped with a universal input tray that fits all kind of standard 168/184/240pin DIMM without any adjustment. A revolutionary double stroke singulator ensures no-jamming operation. High throughput design allows for testing up to 8,000 pieces of DIMM a day.With a quick change of Pusher system – the RoboFlex-MiNi will accommodate all types of memory including SDRAM,DDR,DDR2 & DDR3 Memory. This "RoboFlex-MiNi" handler can be used with CST ‘s Eureka2 ,SP3000, EZ-SPD and It supports testing for both Unbuffered and Registerd DIMM on the same handler system without any additional setup. Options for 200pin SODIMM and 204pin SODIMM are available. Watch the youtube video of the Handler in Action.